The Royal Fortuna with its 29 meters long is the ideal boat to discover the last treasures of Indonesia. Fast, stable and spacious, he can access places where bigger boats cannot go due to their size. The Royal Fortuna decorated with a new fresh and tropical design is the dreamboat for tropical vacation with your best friends or family. Built as a traditional phinisi schooner, The Royal Fortuna was built in 2009 by the Konjo tribe in south Sulawesi. Entirely refurbished in Bali during summer 2017, The Royal Fortuna made his first cruise the 1st December 2017 from Bali to its new home base Labuan Bajo and Komodo National park. The Royal Fortuna has 5 cabins on 2 decks. 4 cabins are located on the main deck with 2 cabins with double bed and 2 others with 2 single bed per cabin. On the upper deck the fifth cabin comes with a double bed and one single bed making it ideal for couple traveling with their child. Each cabin has wardrobes and big fan. The Royal Fortuna can accommodate a maximum of 11 passengers willing to explore the beauty of Indonesian waters. The Royal Fortuna crew is composed of 7 experienced sailor. Two captains will bring you to places you never knew they were existing before and the English speaking cruise director will make sure you are having the cruise of your life aboard and will go with you to explore the richness of Komodo National Park’s underwater world. The new Royal Fortuna design comes with plenty of tropical wood and modern design. 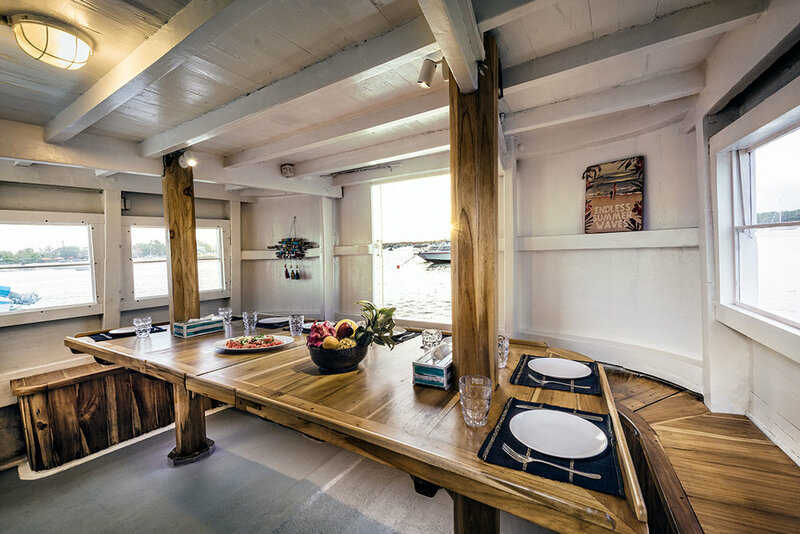 On the main deck there is an indoor dining area as well as a panoramic outdoor dining area perfect to admire all the stunning landscapes you are surrounded by. On the upper deck are two relaxation spaces with loungers and beanbags where passengers love to spend a lot of time scanning the horizon looking in search of the unexpected. Indonesian waters are full of surprises such as playful humpback and blue whales, flying mantas and even the very rare mermaid!